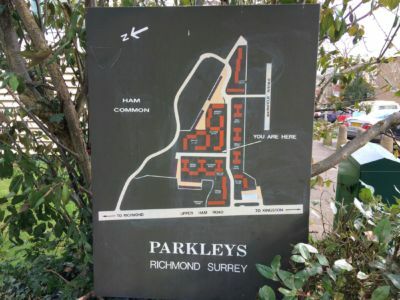 The Parkleys Development was built between 1954 and 1955 by Bargood Estates on the site of Ham Farm Nursery and Cairn House. The company was established by Geoffrey Townsend and Henry Cushman. Eric Lyons was appointed by the company as its architect. Geoffrey Townsend and Eric Lyons met in the 1930s when they were both studying architecture at Regent’s Street Polytechnic. 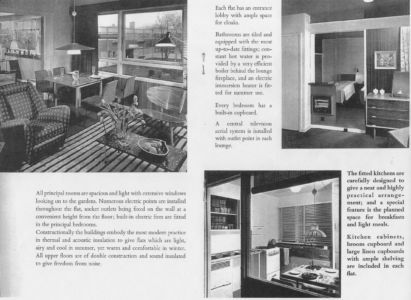 Eric Lyons, who had worked in the offices of both Maxwell Fry and Walter Gropius, was inspired by the designs of the Modernist movement whilst Geoffrey Townsend admired the more traditional village-like architecture of affordable, well-designed suburban homes built in landscaped grounds. After the war they started a practice together in an office at Eric Lyons’ home in East Molesey. The two men became increasingly frustrated by their commissions which were mostly war-damage repairs and restoration. 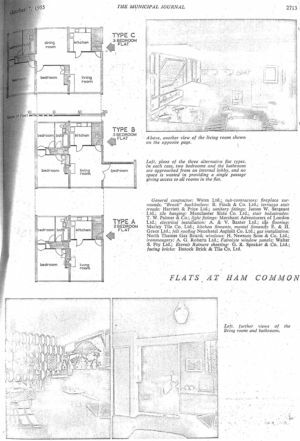 They had some individual commissions for private houses but their interest was in private housing schemes for which there was limited demand at that time. 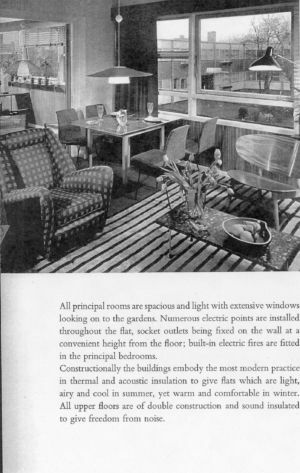 By the early 1950s Townsend had resigned from The Royal Institute of British Architects (R.I.B.A.) and with his business partner Henry Cushman (an agent for the Alliance building society) formed a property development company, Bargood Estates. 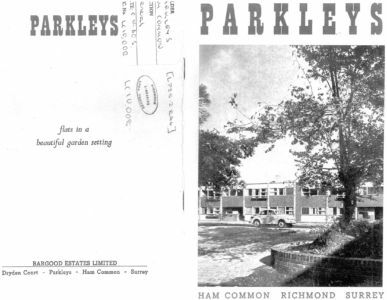 In 1953 Bargood Estates bought its first piece of development land, some 4 acres in Ham which consisted of Cairn House, a large house with a mature garden on Upper Ham Road, and Ham Farm Nursery which it had purchased from the farmer James Walker; his family had farmed the land since the mid 1880s and in 1949 he had bought the freehold from Buckminster Estates the company responsible for the estates of the Dysart family. Later a building developer Leslie Bilsby joined Townsend and Cushman. Bargood Estates appointed Townsend’s friend and partner Eric Lyons as its architect with the brief of designing a number of private homes within landscaped grounds. 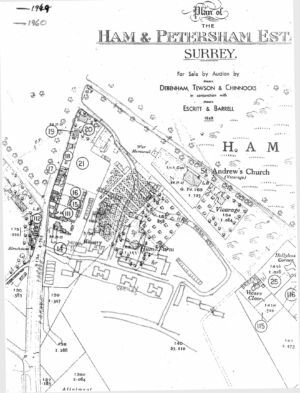 Maybe to realize additional finances, possibly for aesthetic or planning reasons, Bargood Estates retained a strip of the former nursery land adjacent to Ham Common and divided it into the 17 freehold building plots of ‘Ham Farm Estate’ which it sold immediately with certain restrictive covenants. Houses were built between 1955 and 1956 along what became Ham Farm Road. Approval was granted for Lyons’ plan to build 15 blocks with 169 flats in total, 87 garages and along the eastern side of the Richmond Road a block of six shops with maisonettes above. The development was designed to attract young, professional people who were purchasing their first homes. Building costs were kept to a minimum and purchasers were offered an innovative endowment mortgage scheme. 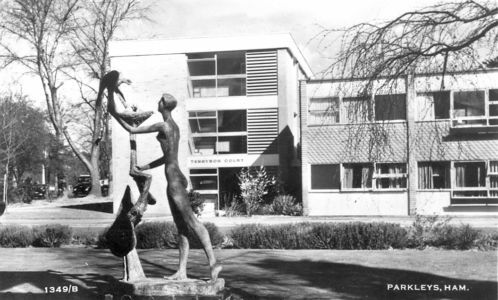 The name of Span Development was not used until the late 1950s, but it is said that this name represented the innovative, complete process from land acquisition through the building and landscaping to homes for residents who collectively managed their homes and grounds through a residents’ management scheme. 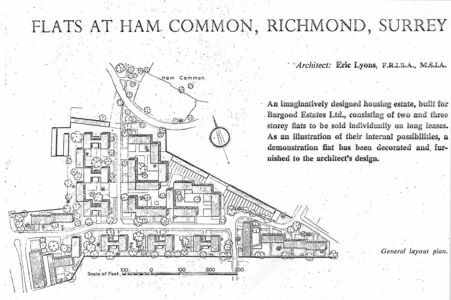 Eric Lyons’ plans were designed to promote a sense of community for residents by incorporating his Modernist ideas with the more traditional style favoured by Townsend. 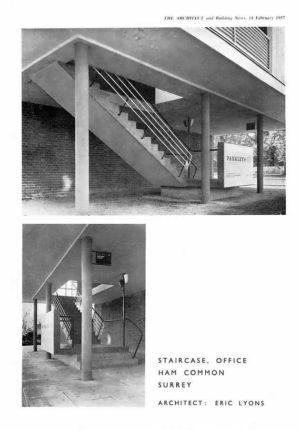 The blocks of flats were simple to construct, light and spacious inside, with wide staircases and entrance halls. Lyons arranged the blocks in either a three-storey H plan with a central stairwell or two storey blocks built around shared courtyards. 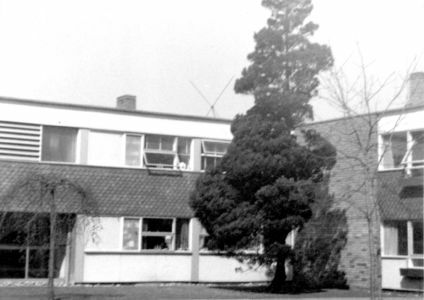 The buildings were set within communal, landscaped gardens where children could play and neighbours might meet. Most rooms offered a view of either the shared courtyards or gardens. 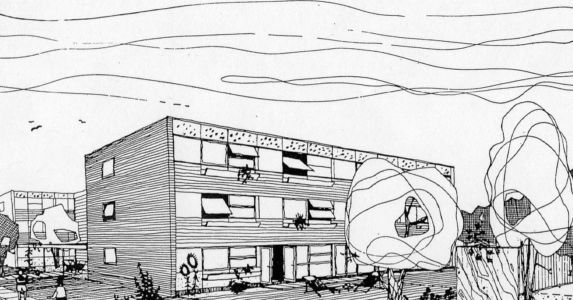 The development was car free (a radical deviation from most post-war development) with concealed garage blocks at the back of the site, encouraging residents to interact along communal pathways and in the courtyards. The blocks were built of brick with concrete slab floors, flat roofs and vertically hung tiles. The windows were timber framed; the larger ones were side hung. Inside there were oak, parquet blocks laid in a herringbone design and kitchens with fitted units. 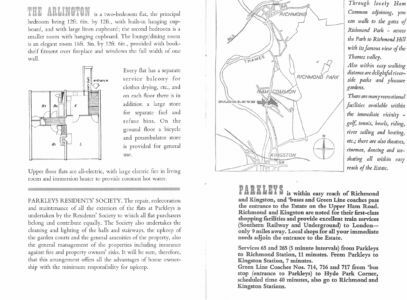 Potential purchasers had the choice of three designs: ‘Type A’ (639 sq ft) had a reception room, kitchen, bathroom and two bedrooms; ‘Type B’ (The Arlington) which had an extra bedroom (733 sq ft) and ‘Type C’ with three bedrooms and a dining room in addition to the standard living room, kitchen and bathroom. Each block was named after a poet. In 1955 Ivor Cunningham joined with Eric Lyons and became responsible for landscaping the site. He had worked in Stockholm in Sweden where blocks of flats were set within generously planted gardens. It was the intention to retain mature trees and therefore the blocks with their access pathways of cobbles, gravel or concrete, had been arranged around the mature landscapes of the former Cairn House and Ham Farm where possible. Although Geoffrey Townsend had previously purchased large quantities of shrubs and trees, it was Ivor Cunningham who was tasked with planting them; his design combined a modern interpretation of an established Georgian city square with that of a village green. Each courtyard was given its own generous planting scheme. There was a fountain in Marlowe court but this has been replaced by a group of trees. Some of the pre-development trees can still be seen. 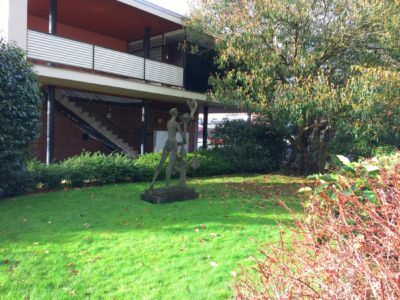 It was mandatory for all residents to belong to the Residents’ Association which elected its own representatives to manage and maintain the buildings and landscaped areas; it was believed that this would reinforce the feeling of community and pride. (A YouTube film suggests that consideration was given to the inclusion of a sobriety clause in the conditions of sale – but the idea was dropped). Townsend sat on the residents’ committee until it was established. 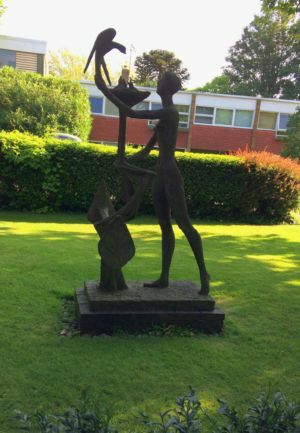 The Residents’ Association proved to be highly successful not only in maintaining the buildings and grounds but also in arranging social events like summer parties and treasure hunts. 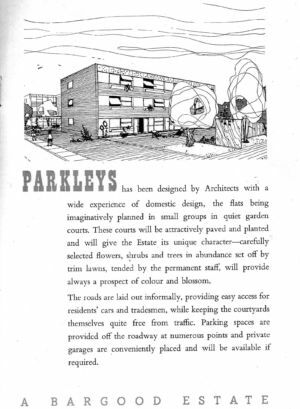 The flats were sold with 99 year leases but circa 1974 the Residents’ Association bought the freehold of the residential blocks and 4 years later bought the freehold of the garage blocks. Now the association attends to the maintenance of the exteriors of the blocks on a 5-6 years cycle and communal areas, while the residents are responsible for the decoration of their own flats. The Parkleys development has won several awards, it established the reputations of Lyons and Townsend and is now Grade II listed and within Richmond’s Conservation Area 67. 2001 May: Landscape Conservation on Span Estates: A thesis submitted in partial fulfilment of the requirements of the Architecture Association for the Diploma in Conservation (Garden and Landscapes). Barbara Simms.